(San Luis Potosí, 1983) He has lived in Querétaro for 23 years. He works as an educator and editor, giving classes in art history, literature, film and journalism. 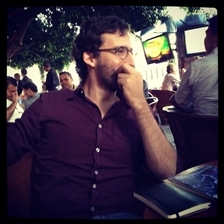 He edited the Querétaro cultural magazine Sada y el bombón and has received, in the non-fiction category, a grant from the Stimulating Creation and Artistic Development Programme.